Can't be bothered waiting to see how many people comment on the other thread, let's just give this a bash and see whether it takes off or fall flat. I started making a poll for this but I think it's just easier if people post their predictions and try not to be influenced by what other people have already put. Not worth doing this if we don't get a few more votes... come on guys, not that difficult to guess 4 scores and see how we do . i think you should still do it. I might stick on one myself - can you cash out on them? Fenerbahce about to kick off. We will go with what we've got today from a whopping four participants. The Fenerbahce game has 4 different votes so I've chosen the one with the longest odds which is @Cannabis 3-1. Everton 2-0 has been voted by me and @Stan. Malaga 2-1 has been voted by me and @Smiley Culture. 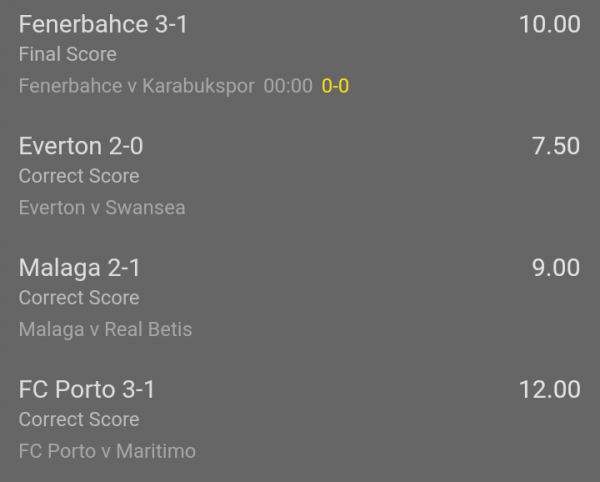 Porto has four different votes so I've picked @Stan's 3-1 due to it having longer odds. Hopefully we have more votes next time so it doesn't just take 2 people to be the most popular score. Let's see how it does. I've backed it at 10p per bet costing me a whopping £1.50 if we get 0/4 correct. 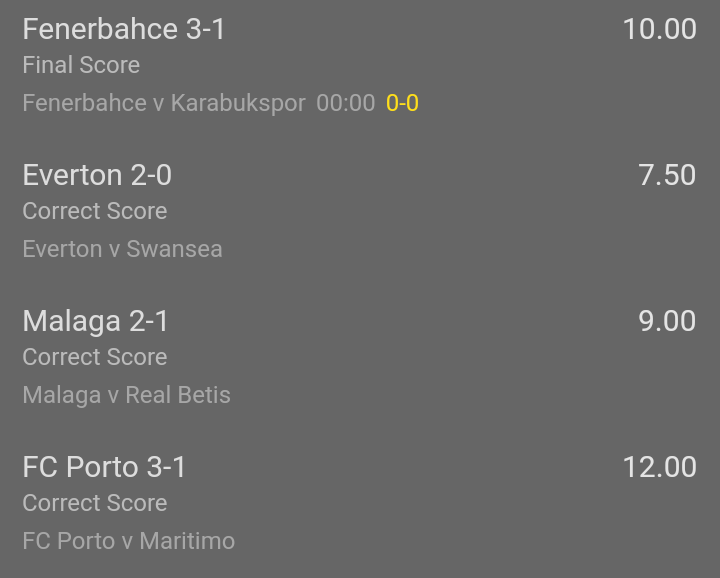 One more goal for Porto needed. Did you back yours? The Porto 3-1 is in the overall one at 11/1. Gonna see how I go in this not betting on it and take it up if it proves succesful. Well aware it might just be a purple patch if it works but we'll see how it goes! Despite @Stan voting correctly for this scoreline 3-1 was our pick at the longest odds so no dice here. No luck on this one as nobody sees the away win coming. An unlikely winner at 11/1. Despite the four of us predicting four different scorelines, @Stan's 3-1 pick went into our lucky 15 as the longest odds and with the help of a Maritimo red card this one comes in. Count me in for future. Totally missed this thread. @RandoEFC how do 'units' work? It's just how much you want to put on. I backed this today at bet365s minimum bet of 10p per bet, 10p being one unit for me, so my -3 units is a loss of 30p. For someone else they might decide they can afford to put £15 on so a unit for them would be £1 and they'd be down £3 (3 units). Might just change it to £1 per bet for simplicity.